This could be the biggest feather in the government’s Make In India cap yet. Apple is in talks with the Indian government to start manufacturing its products in the country, the Wall Street Journal has reported. In a letter to the government last month, Apple outlined its plans and sought financial incentives to move ahead to start setting up factories in the country. The company has also been meeting with senior Trade Ministry authorities in recent weeks. Apple CEO Tim Cook had been on an extended India trip earlier this year, when he’d launched a charm offensive, meeting Bollywood celebrities and even watching an IPL match. He’d also met high ranking government officials as a part of his visit. It was thought that his visit had to do with Apple looking to set up Apple stores in the country. Indian laws had prevented Apple from setting up retail shops in India, but the government had reportedly relaxed regulations after his visit. The Indian government is wooing foreign companies to set up manufacturing facilities in India. Several prominent companies, including Hitachi, Foxconn, Volvo and Xiaomi have started work on manufacturing products in India. Apple, too, has been ramping up its India operations. It opened offices in Bangalore and Hyderabad during Cook’s visit. 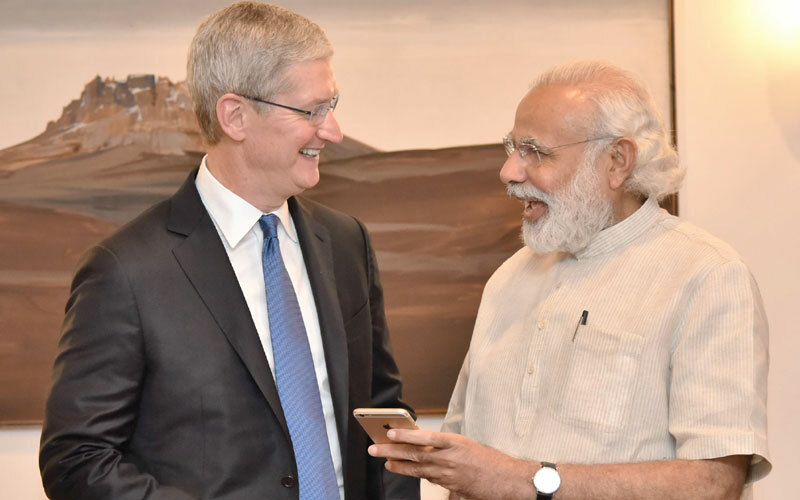 Tim Cook also seems to have developed a rapport with Prime Minister Narendra Modi. Modi is the only politician Cook has wished a happy birthday on Twitter, with his wish this year said Vasudev Kutambkam, which means the “the world is one”, and was seen as a hint that Apple was looking at a level playing field when operating in India.